It's been a while since I've done a UV-3R post, but this is a cool project. "I was wondering when they'll imitate the body design of the Yaesu/Standard/Horizon VX-7R/HX470/VXA-710." Which reminds of where this all started for me - the Baofeng UV-3R copying the Yaesu VX-3R. Imitation is the sincerest form of flattery. The first surprise I had was the size of the UV8D. From the pictures I had seen, I thought it was going to be a hefty radio. The reality is different. 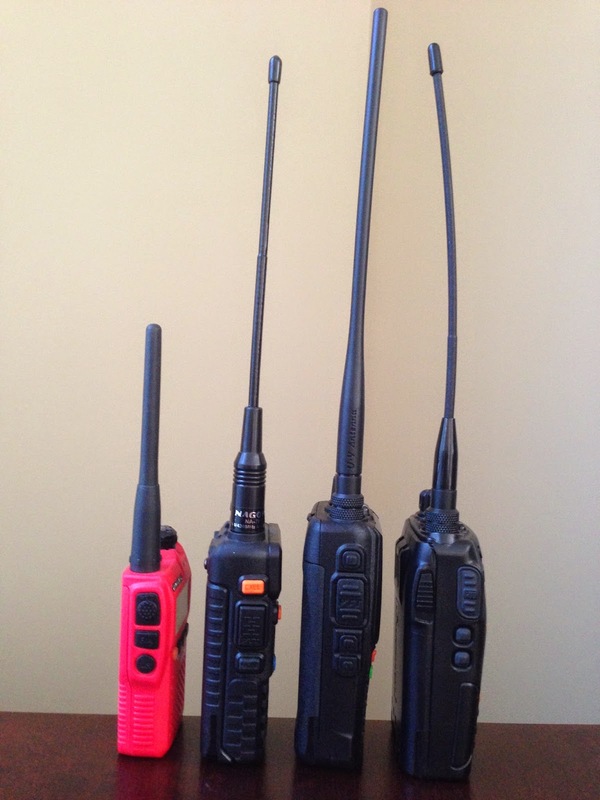 In the pictures you can see (from left to right) the Baofeng UV-3R, the Baofeng UV-5R, the Wouxun KG-UV8D, and the Wouxun KG-UV1DP. I'm sure this is old and not terribly interesting news, but I just stumbled across the light blue UV-3R. I remember when all the colors used to be a big deal. Now, we expect five colors and sixty varieties of the case. An anonymous poster left this link to a project to control a UV-3R via software. Hans noticed that Baofeng has a new website (his post, their site), and I noticed an additional link to the Baofeng Shop. The shop is populated with lots of radios, but they all say $0. Some of the links are broken. So are they working on cutting out the middle man? I'll dig a little more, but I found the site interesting. I've seen it enough times on the Yahoo Group and in the comments here that I think it bears repeating. Step 1: Make sure the plug is firmly pushed in to the radio. Step 2: Push the plug some more. Step 3: Find your strongest friend and ask them to push on the plug even more. Step 4: Check the driver, verify the COM port, download the latest version of the software, etc. "Best of the pack: Wouxun KGUVD1P. No real flaws to report. The KGUVD1P is verystrict when it comes to battery voltage though. It will switch off immediately,there's no escape. Switching to low power won't help. Buy a spare battery! matter of taste, of course). Strengths: capable of RX/TX on 350-390MHz. Batterylife is unbelievable. The stock antennas of these two HT's are as good as they get, no need for areplacement. The Baofeng UV-5R is interesting because of its price - you can buy two UV-5R'sfor the price of one Wouxun. If you can live with its quirks, you have a heck ofa deal." "The cheap UV-3R can't be used here on 70cm. Total RX collapse. The UV-5R does alot better and is usable. The Quansheng TG-UV2 does even better, and the champion of Chinese HT's is the Wouxun KG-UVD1P. I hardly notice the influence of a 5+5+10 KiloWatt digital TV transmitter on that one, which is located only half a mile away from my QTH. Even the best Chinese HT is no match for my Yaesu VX-177 mono band though. Thatone doesn't give a d*** about these signals. And it should, as I can buy fourUV-5R's for the price of one VX-177." If you don't already follow Hans at his blog, I highly recommend it. "During my morning commute, my train passes south of my club’s main repeater site. Now this is on a rather high building, in one of the highest points on western Long Island, and is pretty much line-of-site for a 4-5 mile stretch of my train ride. I tested to see if I could key up our 220 machine, and it seems that the effective range was about 4 miles this morning. Now that was just keying the repeater up. I’ll have to check to see if I can actually be HEARD on it." "Great News - The TYT TH-UV3R is in stock and shipping. I have been using one for the past 2 weeks and I love it. The size is about the same size as the Baofend UV3 but construction is much stronger." "The New TH-UVF9 Dual Band HT (4 watts) will be available soon. I will have 2 of these to test within the next week and I will update everyone on this new radio. I have pictures posted on this site." This is the first I've heard of the TH-UVF9. Here is the link to the listing. No price yet on this dual band, dual display 4 W unit. He does mention he will have one at Dayton. 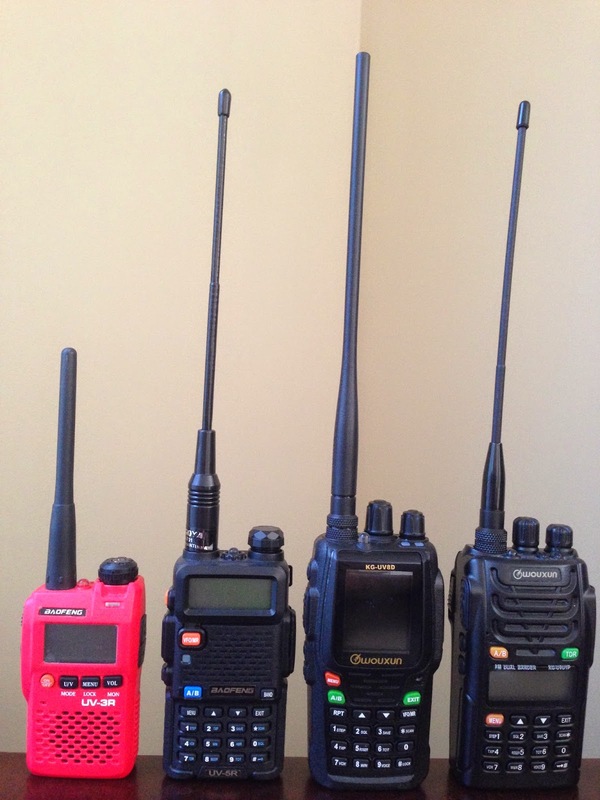 "Baofeng UV5 - They report that the problems have been fixed and shipping the updated ones now. We will wait to test them and then release them to sell at that time. If ordering from other companies you might want to wait until they get rid of their old inventory before ordering." Amazing how quickly they can respond with fixes. They are getting a lot of free testing from the hams that are early adopters. 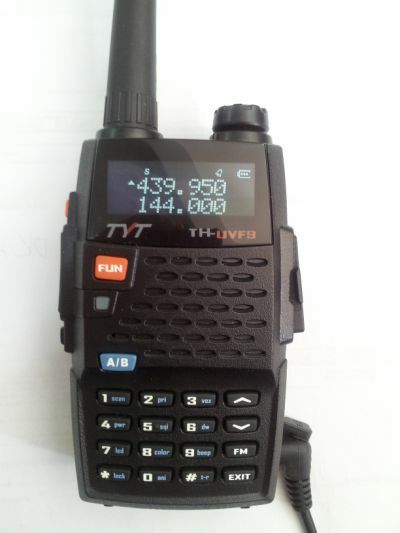 "Just in case your wondering, the Baofeng UV5 looks like a TYT radio however it is not. TYT did not sell or mft the radios for them, They simply took TYT's case design and copied it. There have been some questions on who makes the TYT radios for them .... TYT is the MFG!" I am beginning to think the cases are a core competency for China. They can make copies faster than anyone and in any color you like. Someone asked in the comments if the FM Broadcast receive frequencies could be expanded. I had read in this thread that 65-108 MHz is the FM Broadcast band in Eastern Europe. So are there regional versions of the UV-3R? In the thread, people report difference coverages. For something like this, I would assume it is much easier to have one version that has the wider range that covers all regional FM frequencies. We treasure every opportunity to meet you. We cordially invite you and your colleagues to visit our booth 3D-A25 in Hall 3.